LOUISVILLE, Ky. — For the fifth year in a row, Churchill Downs was the setting for the largest event in the Nation honoring surviving family members of fallen military Service members. More than 800 brothers, sisters, moms and dads of those lost since 9/11 were treated to a day at the races at the storied horse racing track in Louisville, Nov. 2. Kentucky Department of Veterans Affairs Commissioner Heather French Henry joined Adjutant General, Maj. Gen. Edward W. Tonini in recognizing the family members during an afternoon luncheon in Millionaires’ Row. Henry told the families that remembering the fallen is one of the most patriotic missions for Americans, and days like this one are about legacies that we will not forget. Family members from 10 states, Alabama, Georgia, Illinois, Indiana, Michigan, Missouri, Ohio, Tennessee, West Virginia and Kentucky were present for the emotional day, full of camaraderie and friendship. 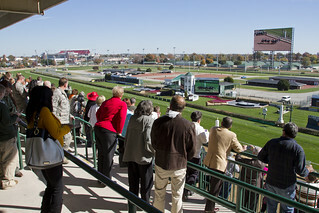 Churchill Downs partnered with Humana Government Services and the Kentucky National Guard to support Survivors Outreach Services (SOS) in the unique event. A highlight of the afternoon was a race named in honor of the Survivors of Fallen Military Heroes. 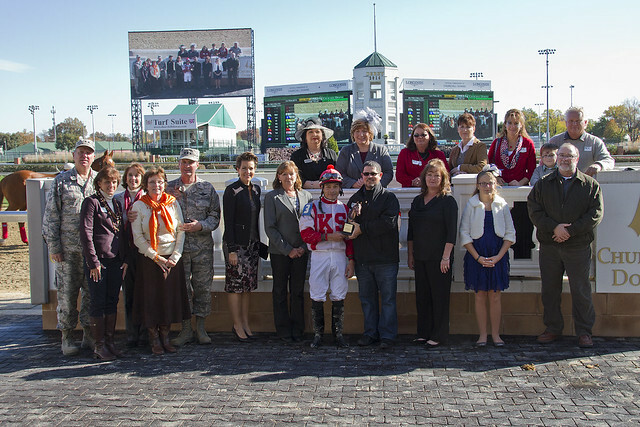 Joann Lake from Elizabethtown, Kentucky was among the Gold Star Family members chosen to present the trophy to the winning jockey and owners in the winners’ circle. Lake’s son, Navy Chief Warrant Officer Jonathan Gibson was lost over the Red Sea last September. The day at the races was Lake’s first Survivors Outreach event. Becky Lambert was also in the winners’ circle and attending the day for the first time. She lost her son, Marine Sgt. Jonathan Lambert in Iraq in 2003 and has found strong support through SOS. “SOS helps us to get the benefits and the service available for us and that the families are not forgotten, our loved ones are not forgotten,” said the New Site, Mississippi-native. 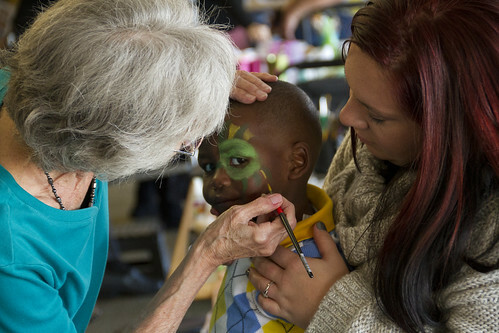 In addition to the races, the meal and the interaction, children were treated to face-painting and arts and crafts. SOS organizers expanded the event this year for the growing interest and attendance, which increased by nearly 200 people over last year’s event. 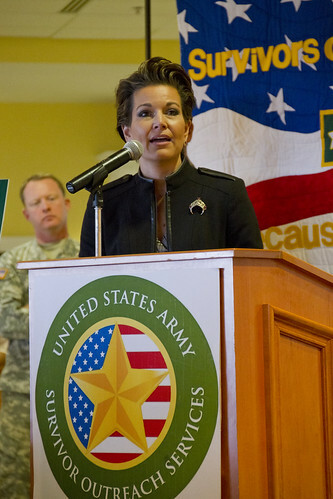 A variety of senior military leaders from the National Guard, Reserves and active duty were also on hand to support the event, including the Vice Chief of the National Guard Bureau, Lt. Gen. Joseph L. Lengyel. He praised the families members for their courage and expressed his gratitude for the fallen heroes with a pledge of support. Click here for more information on Survivors Outreach Services.